Democrats gained control of the House of Representatives, meaning divided government and changes in how Washington works -- and AppleInsider takes a look at possible implications for Apple's initiatives in Washington D.C., and on a more local level how the company may have to spend in its home state. The 2018 midterm election results are in the books, and while both major parties can point to victories in Tuesday's vote, the headline is that the Democrats have captured a majority in the U.S. House of Representatives. Meanwhile, Republicans expanded their majority in the U.S. Senate. The change almost certainly means two years of gridlock in Washington unless the parties actually decide to work together, and therefore less of a possibility of major legislation passing in that time. And while the new Congress is unlikely to bring about major changes for Apple, differences are possible at the margins. Apple does not have a political action committee, nor does it directly endorse candidates. Apple executives themselves have been known to donate, although Tim Cook's lone political contribution in the current cycle, according to the FEC, was a $2,700 donation to Rep. Zoe Lofgren, a California Democrat who won on Tuesday. It's part of a trend, described by the Washington Post, of Silicon Valley leaders largely staying on the sidelines in this year's election. However, according to OpenSecrets.org, Apple employees donated $1.4 million to candidates in the cycle, with unsuccessful Democratic Texas Senate candidate Beto O'Rourke the top recipient. Apple spent $1.33 million on lobbying in the third quarter of 2018, according to its most recent disclosure, and the company has spent about $5 million overall in lobbying expenditures in 2018. The main issues included everything from patent reform to music licensing to piracy to corporate tax reform implementation to education technology funding. None of these are likely to be near the top of the legislative agenda in 2019. It's even less likely that the next two years will see a repeat of the tax reform package that passed in late 2017, with Apple's support. Rep. Nancy Pelosi (D-CA), the Democratic leader in the House of the Representatives for the past 16 years, is expected to once again become Speaker of the House. Pelosi represents Northern California, where Apple is located, although her history related to Apple is somewhat checkered. The presumed next speaker, according to a disclosure form this year, owns a significant amount of Apple stock, most likely through her husband Paul. A known user of Apple products, Pelosi was spotted glancing at her Apple Watch during the State of the Union address in 2016. Also in 2016, Pelosi criticized Apple's Tim Cook after he hosted a fundraiser for current Republican House Speaker Paul Ryan. 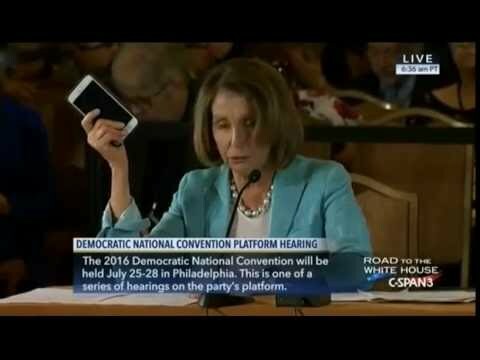 Pelosi then drew criticism, during a Democratic National Committee meeting a few months later, when she held up an iPhone and stated that "in this smartphone, almost everything came from federal investments and research," going on to state that "Steve Jobs did a good idea of designing it and putting it together. Federal research invented it." Her statement giving credit to "federal research" was demonstrably wrong, though. A spokesman for Pelosi later stated that the Congresswoman "counted Steve Jobs as friend and meant no disrespect to his legacy." The change in House control also means a change in leadership for each committee in that body. Earlier this year, the House Energy and Commerce Committee wrote a letter to Apple about its data protection policies. The current top Democrat on that committee is Frank Pallone of New Jersey, who is expected to take the gavel. Pallone hasn't made a lot of public comments about Apple, although his wife, Sarah Hospodor, worked at the Environmental Protection Agency under Lisa Jackson, the then-EPA administrator who is now Apple's Vice President of Environment, Policy and Social Initiatives. The House Judiciary Committee, back in 2016, held a memorable hearing at which Apple's Bruce Sewell went head to head with then-FBI director James Comey. In the event that Apple is ever brought before that committee again, Democrat Jerry Nadler of New York is expected to take that gavel. Elsewhere in the House results, Rep. Duncan Hunter (R-CA), whose recent federal indictment alleged (among many other things) that he had made multiple improper purchases at Apple Stores, was re-elected to another term. Apple's home state of California will have a new governor, Gavin Newsom. The former San Francisco mayor and California Lieutenant governor has been a booster of the tech industry in the past, even appearing with Steve Jobs at the opening of San Francisco's first Apple Store in 2004. But Newsom has at times been critical of the industry's power, as he previewed the phone call he plans to make to Tim Cook should he win in a recent interview with USA Today. "Here's a preview of a call I'm going to make to (Apple CEO) Tim Cook if I'm governor... I'm going to say, Tim, let's get together this week... Congratulations, all these (corporate) tax cuts and repatriated (overseas) earnings present an extraordinary opportunity to make investments in your backyard, ones that address your fiduciary responsibilities to your shareholders but also recognize the broader, negative social issues that have been the unintended byproduct of your success," said Newsom. "The answer is no until you ask... But I want to have these conversations." California Attorney General Xavier Becerra, who brought charges against those responsible for the recent Apple Store theft ring in that state, was re-elected Tuesday. Ro Khanna, the Democratic Congressman who represents Cupertino and much of the rest of Silicon Valley, was re-elected as well. In Wisconsin, Gov. Scott Walker was defeated in his tight re-election race by Democrat Tony Evers. A key issue in that race the controversial deal Walker struck with Apple supplier Foxconn to build a plant in that state. In North Carolina, reports earlier this year stated that Apple was nearing an announcement to place a new corporate campus in the Research Triangle area of the state. But as of August, reports stated that Apple had some concerns about proposed constitutional amendments in the state. On Tuesday, North Carolina voters delivered a mixed verdict, as amendments to restrict the governor's powers failed, while voters approved a voter ID requirement. It's exceedingly unlikely that Apple will be anywhere near the forefront of Congress' business in the new year. Any effect Tuesday's results will have on Apple will likely not be known for awhile. What probably won't change is Tim Cook and Apple's generally cordial relationship with the Trump Administration, and their posture of pushing the administration for legislation and regulatory policy in its interest while chiding it for policies they oppose. If you want to talk about how the election will affect Apple, that's great, by all means, go ahead. However, this is not a place for your political manifesto. We didn't make this post a partisan bicker-fest, and neither will you. Perhaps I wasn't clear about the first comment in the thread. Re-read it if you've found your comment deleted. Bans will be doled out for continued behavior in defiance of moderation. Despite what you may think, you have no clue what our political orientation as a publication as a whole is -- because we don't have one. The "if you're not 100% for us, you're 100% against us" mentality is asinine, and childish. Every large city in the US has a liberal bias. That is where the highly educated employees are so it really doesn’t have anything to do with California per se. Rural areas are red and urban areas are blue. That is just the way it is. Mike, but I’ve been here long enough to recognize that nearly all of the writers and mods are Democrats. It doesn’t need to be announced because Political Outsider was shut down for becoming too much of a hot potato and DED has submitted (without editing) highly incendiary political spin pieces in the past. Your own political views I have found to be more moderate. Given that two of our day-shift writers are from the UK, this is a strange assessment to make. Political Outsider was shut down because it was driving forumers away, and impacting Google search traffic because of hostility, and was super not-cost-effective to moderate. If I had my way, PO would still be open and people would stop being dicks to each other about it, but since I can't have the latter -- which continues to be proven on a day to day basis out in the regular forums -- I can't have the former. I have no clue what the moderators' leanings are, nor is it particularly relevant, as they do not generate content. This statement is clearly a political opinion - if Apple is looking to develop a significantly higher business presence in NC then they should be concerned about the NC government’s power structure, including the previous super majority; however, Apple the company should have zero care about voter ID. Apple the company can care about whatever it wants. It’s your political opinion that it shouldn’t care. I guess the term ‘social responsibility’ is not something you’re familiar with? Her statement giving credit to "federal research" was demonstrably wrong, though. How is it demonstrably wrong? No evidence is cited to support this claim. The linked article does not actually dispute it. DARPA and related federal agencies have in fact created much of the core technology that Silicon Valley commercializes. Did you know Siri is named after SRI International, a DARPA-funded research agency? Did you know autonomous vehicles were nurtured for years by the "DARPA Grand Challenge"? The list goes on and on. This is not to take anything away from the difficult work that goes into commercializing a technology. That's what Pelosi's clarification was about. But there are a lot of people in SV that get offended by the mere mention that much of what they do would not be possible without billions of taxpayer funding over the 10-20 years that it takes to develop a technology from its origin to where it's viable commercially. Wasn’t Apple lobbying against the tariffs or was that just Cook? Cook opposed tariffs, but there was no literal lobbying effort as far as I know. I guess the term "shooting yourself in the foot" is not something you're familiar with? Why would anyone want to increase the tax burden on the company they work for? The more money they pay in taxes means fewer dollars for investment purposes. Corporations voluntarily giving back to their local communities is not a foreign concept. No where did Gavin Newsom say they’re going to raise the corporate tax. They are asking for Apple to contribute more to support their local community/the state of California by investing more money in the state. I think Tim Cook has done an exceptional job of separating his personal and private perspectives with those that he represents as the very public leader of the worlds most valuable company. I don’t expect that to change any time soon. Whenever Apple principals are called to participate in a forum with political players, such as the early summit of technology company leaders, he shows up and does a commendable job fulfilling the responsibilities of the role he serves. Same thing with engaging in testimony before committees. He stays engaged, participates, and maintains working dialogs with everyone. All the while he keeps his teams on task and focused. He does exactly what his role dictates and obligates him to do. Tim Cook and every other employee of Apple are still entitled to their own opinions and all of the private and public privileges that are afforded to individuals regardless of their role. Tim and other Apple employees are engaged in causes outside of their role and I see no problem with that. As long as everyone is fulfilling their responsibilities in the role that they serve and not discrediting the company or drawing negative attention that reflects poorly on the company I don’t see any impact on Apple in the current environment. Tim Cook has the most challenging possible situation because he is so universally recognized and effectively always on the job. If other Apple employees handle themselves in difficult situations only half as well as Tim Cook does it will be smooth sailing ahead for Apple. No investing more money in the state, thus employing more well paid Apple workers, just exacerbates the “problem” from locals perspective. Apple is already working on the real solution: that second headquarters not in California.